CARA recently released results of two surveys—one of Catholic men who have become priests and the other of Catholic women who have become sisters or nuns. The results provide interesting insights about what might cause men and women to consider these vocations and what might cause them to follow through on this consideration. Yet “cause” is a strong word and more often than not the results instead reveal correlations. For example, 65% of men who become priests indicate they participated in Eucharistic Adoration before entering the seminary. Does Eucharistic Adoration cause a man to become a priest? In most cases, probably not. Instead, the same thing(s) that made that man interested in becoming a priest also likely made him interested in participating in in Eucharistic Adoration. Most are well aware that too few men and women are choosing a religious vocation to keep up with those lost to retirement and mortality. The numbers of priests, brothers, and sisters is declining annually (numbers of permanent deacons and lay people in parish ministry are increasing—a topic to be covered in a future post). One of the biggest challenges for the Church is to inspire more American Catholics to seriously consider these vocations. CARA surveys of the adult Catholic population consistently reveal that more than 15% of Catholic men say they have ever considered becoming a priest or religious brother. In the most recent survey this percentage was 17% (margin of sampling error is ±4.5 percentage points). However, only about 3% of Catholic men say they have considered this “very seriously.” That small percentage actually represents a large real number. That percentage is equivalent to about 840,000 men in the United States today (there have been 12,958 men ordained as priests in the last 25 years). We can roughly estimate that about one in 100 Catholic men who say they “very seriously” considered becoming a priest are likely to follow through and be ordained. If the Church could just increase that to two or three in every 100 who “very seriously” consider this, concerns over priest shortages would end. However, things may not be so simple. 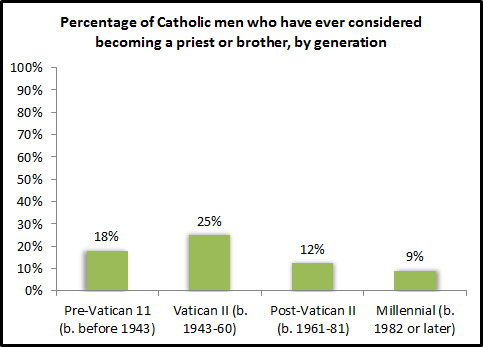 Generational differences show that young Catholic men are much less likely to say they have ever considered becoming a priest than those of the Vatican II Generation (those born between 1943 and 1960). Fewer than one in ten male Millennial Catholics (born 1982 or later) say they have ever considered becoming a priest. The pattern for Catholic women’s consideration of a religious vocation is similar. 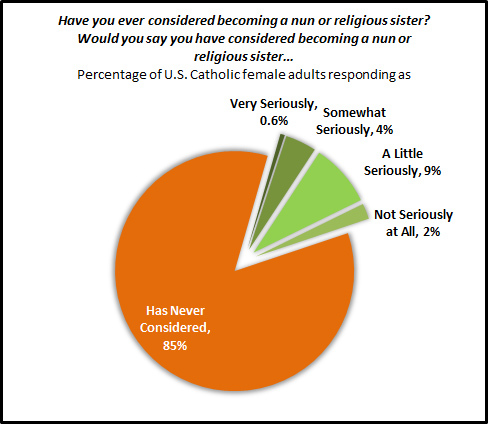 Fifteen percent say they have ever considered becoming a nun or religious sister. However, only 0.6% says they have considered this “very seriously.” This is equivalent to only about 170,000 women in the United States today. Thus, there are more than four times as many men who say they have “very seriously” considered becoming a priest or brother than women who say they have “very seriously” considered a religious vocation. 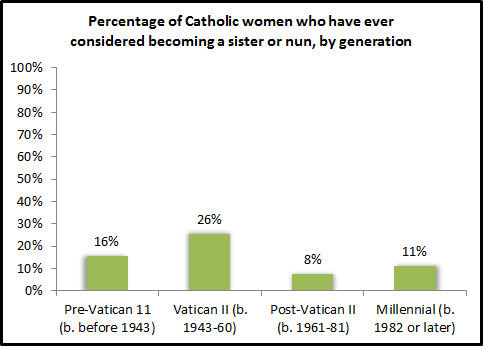 Mirroring the generational differences for men’s consideration of a priestly or religious vocation, only about one in ten women in the youngest Catholic generation say they have ever considered becoming a sister or nun. The likelihood that someone has considered one of these vocations varies by other attributes. 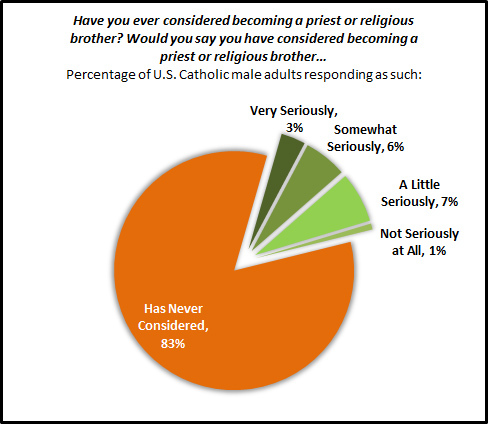 For example, in the general Catholic male population 17% say they have considered becoming a priest or brother but this increases to 21% among Catholic men who attend Mass weekly. Some of these correlates are shown in the table below. Many are consistent with reported behaviors and attitudes found in the recent CARA surveys of ordinands and women professing their perpetual vows. The most significant factor in any CARA survey where the vocations question is asked is attendance at a Catholic college or university. About four in ten men (40%) and women (41%) who have attended, report having considered a vocation at some point. Attendance at a Catholic high school or primary school also provides a modest boost in the numbers. CARA surveys of ordinands and women who have recently professed their perpetual vows also show that encouragement is clearly important. 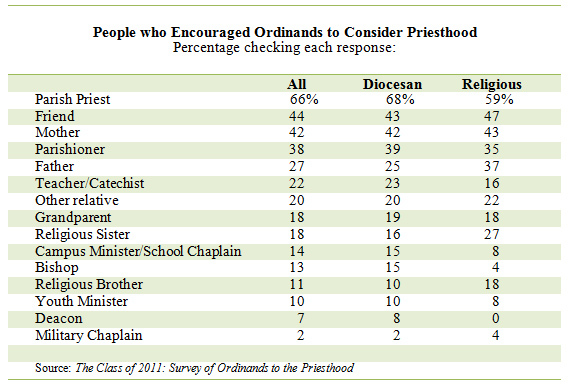 Most ordinands (89 percent) report being encouraged to consider the priesthood by at least one person in their lives. Two in three ordinands were encouraged by a parish priest, while two in five were encouraged by a friend, their mother, or a parishioner. 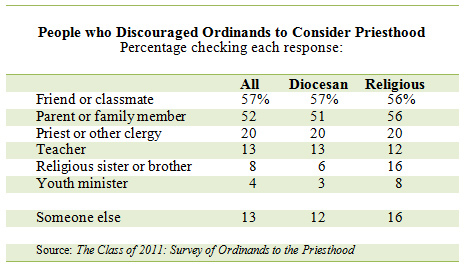 Surprisingly, six in ten ordinands also report being discouraged from considering the priesthood by a friend or classmate (compared to the four in ten who were encouraged by a friend). Half related that they were discouraged from considering the priesthood by a parent or family member. Parents or family members (includes mother, father, grandparent or other relative) are as likely to encourage as they are to discourage ordinands from considering the priesthood. 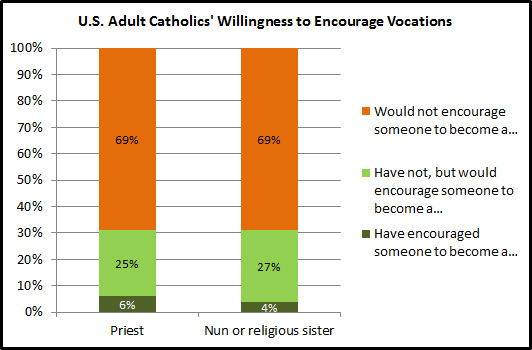 Friends are slightly more likely to discourage than encourage consideration of priestly vocation, while priests are three times more likely to encourage than to discourage consideration of a vocation to the priesthood. Ordinands to the priesthood are generally more likely than sisters professing perpetual vows to report that someone encouraged them to explore their vocation. Only one group—encouragement from friends—is the same for both ordinands and sisters. 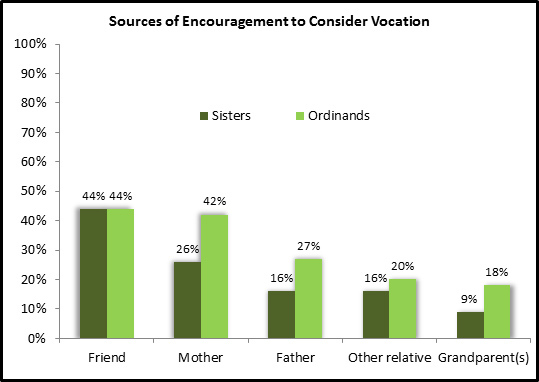 Ordinands are twice as likely as sisters to report encouragement from their mothers, fathers, and grandparents. However, ordinands to the priesthood are also more likely than sisters professing perpetual vows to report being discouraged to explore their religious vocation by a friend. 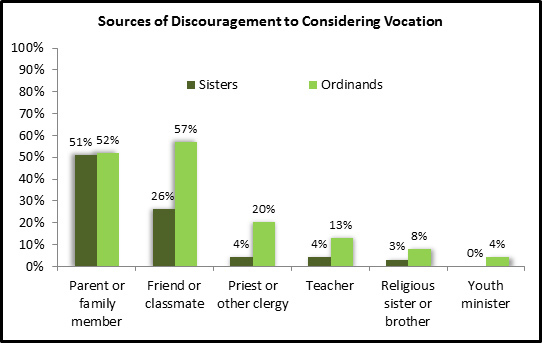 Ordinands and sisters are equally likely to report being discouraged by a family member. Perhaps the biggest challenge to increasing vocations is the encouragement/discouragement dynamic. Getting one more additional person per 100 who is “very seriously” considering becoming a priest to follow that vocation may depend on altering the culture of the American Catholic laity. There are more than enough men who say they have “very seriously” considered becoming a priest. But are there enough people around them encouraging them to follow through on this consideration? Nearly seven in ten U.S. Catholics say they have not encouraged vocations and that they would not do so in the future. These are tough odds to face—especially with consideration of vocations falling among the youngest adult Catholics. -CARA researchers Mark Gray, Melissa Cidade, and Mary Gautier contributed to this post. How does the U.S. Catholic population percentage remain 25% as it has measured in surveys for decades? Robert Putnam and Bruce Campbell provide a typical argument for the religious studies field: “Such stasis in the aggregate is possible only through an influx of Catholics from another source—immigration” (American Grace, pg. 299). Yet rarely do you ever see anyone actually run the numbers to see just what the precise estimated effect immigration is having on the Catholic population. Below is an attempt to do just that. In doing this we may be discovering the impact of something else: some Catholics come home. Let's use 2007 as an example. This is a year in which a number of major studies on religious affiliation were conducted (e.g., Pew, Putnam and Campbell, and ARIS in the following year) and it is also a recent year in which we have all the available data we need to make the calculation (there is always a lag in data collection and reporting whether it is Vatican Statistics, the U.S. Census Bureau, or the Department of Homeland Security). It is the case that surveys typically only include adults age 18 or older. Thus, simply applying the percentages of some of these studies to total population figures (including those under 18) may not reflect reality precisely. However, it is likely that the Catholic percentage of the under 18 population is even higher than it is for adults. Latinos in America—of which more than 60% self-identify as Catholic—are more likely to be of parenting age than those of other races and ethnicities and have a higher fertility rate than non-Latinos. Thus, there are reasons to believe that applying the adult Catholic population percentage to total population figures actually underestimates the total size of the U.S. Catholic population. It is also the case that without the Census including a question about religion, surveys are the best data source we have to study this question. In 2007, the U.S. total population numbered about 299.4 million. Twenty-five percent of this figure is 74,849,500 and represents the survey estimated total Catholic population for this year (note: The Official Catholic Directory always lags behind survey estimates as its Catholic population figure is more of an estimate of parish-connected Catholics—excluding those who self-identify as Catholic but who are not registered with a parish nor regularly attend Mass). In 2008, the U.S. total population numbered about 301.6 million. Twenty-five percent of this figure is 75,405,289. Thus, the survey-based estimated growth in the Catholic population from 2007 to 2008 is +555,789. (Note that multiple surveys continue into 2010 to estimate the Catholic population percentage to be 25%; margin of error is not a significant issue). So how many new Catholics can we account for in 2007 from other data sources? 1,000,118. This is the total number of additions in the U.S. through infant baptism (878,922), adult baptism (42,898), and receptions into full communion (78,298) recorded by parishes nationally in The Official Catholic Directory 2008 (excluding other territories reported there; e.g., Virgin Islands, Guam, Puerto Rico). Twelve percent of this total includes adults. But there are also always Catholics lost in any given year. Most of these occur as older Catholics pass away. The Church recorded 442,729 deaths in 2007. 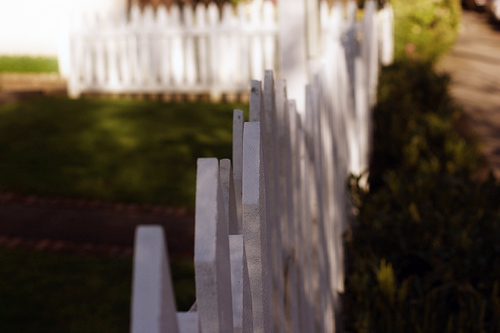 However, not all self-identified Catholics have Catholic funeral services/burial. A better estimate is to assume that about 25% of all deaths that occurred in the U.S. in 2007 were Catholics (there is no reason to assume Catholics have higher mortality than non-Catholics). There were an estimated 2,423,712 deaths in the United States in 2007. Twenty-five percent of this figure is 605,928. Note that there were 1.45 infant baptisms for each Catholic who passed away in 2007. There are also people raised Catholic who leave the faith in each year (about half losing any religious affiliation and the other half adopting a new faith). Pew estimated that 10.1% of all adults in the United States in 2007 were former Catholics. In 2007, the adult population was 225,746,092 and 10.1% of this figure is 22,800,355. Yet nowhere near 22.8 million people left the Church in one year or even one decade. CARA research and others estimate a fairly stable annual retention rate over time. Most often those leaving do so as young adults (median age of 21). CARA research indicates that the annual percentage of former Catholics leaving in any one year recently has ranged from about 2% to 3% of the total. If we assume that 2.5% of all former Catholics left in 2007, the total leavers for the year would be 570,009. Adding deaths plus those leaving the faith leads to an overall Catholic population loss estimate of 1,175,937. That means additions to the faith through infant baptism and adult conversion in 2007 total 1,000,118 and losses by deaths or leaving the faith are estimated at 1,175,937. That leads to an estimated population deficit for the year of -175,819. Thus, through baptisms and conversions alone the Catholic Church can nearly maintain its population but not grow at the rate of the total population (175,819 represents only 0.2% of the total Catholic population of 2007). The gap between the +555,789 growth estimate for the population as measured by surveys and the estimated deficit from the inputs and outputs noted above represents 731,608 Catholics unaccounted for. The Department of Homeland Security estimates that about 901,000 individuals arrived in the U.S. as legal permanent residents or as undocumented immigrants in 2007. Pew and other researchers estimate that the Catholic percentage of this population is typically about 46%. Thus, we can assume that at least 414,629 Catholic immigrants came to the United States in 2007. This figure narrows the unaccounted for gap noted above to 316,979. 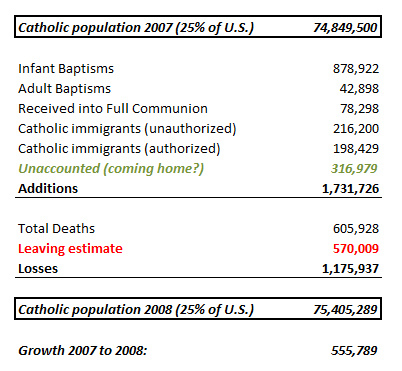 However, note that with the addition of the immigration estimate there is now measurable Catholic population growth that can be accounted for with new American Catholics in 2007 totaling 1,414,747 and Catholic losses still estimated at 1,175,937. This puts the known net Catholic growth for the year at +238,810 (which would be a growth rate of +0.32% compared to +0.74% for the total U.S. population). But survey estimates of the Catholic population post-2007 continue to measure that about 25% of the U.S. adult population self-identifies as Catholic (e.g., the 2008 General Social Survey estimates this to be 25.1% which is identical to the ARIS estimate of the same year). So who are the 316,979 other unaccounted for Catholics? They are “in” the survey data so where can we find them in the population? First, it is likely that immigration estimates are slight undercounts and the Catholic percentage of immigrants may be higher than estimated. Thus, immigration could matter a bit more than estimated but immigration cannot be the only factor in maintaining the Catholic population percentage at 25%. Note that Catholic immigrants are estimated to account for about 24% of all new Catholics in the United States in 2007. And after 2007, as the recession hit, there was a decline in the number of Catholics who are foreign-born as many immigrants returned to their country of birth. Yet still in 2010, the General Social Survey estimates the U.S. Catholic population percentage to be 25.2%. Third, the unaccounted for growth may also be related to some degree to former Catholics who have “come home.” This merely implies a renewed self-identification as Catholic and may not reflect Mass attendance. It is an understudied phenomenon. Most research in recent years has analyzed religion in terms of a single change—from a childhood faith to a new adult faith (or no faith). Yet, more switching is undoubtedly occurring. This includes those who leave their childhood faith—most likely to have no affiliation at all—who then later return to that same faith as they marry, have children, face difficulties in life, or begin to think of their own mortality. No systematic, national, faith-specific estimates for just how many people do this annually are available from any recent studies (although we can more directly measure this in other countries where a religion question is on their census). It also appears that survey questions currently used to measure affiliation and retention may not be accurately measuring religious change in the United States. There are some diocesan estimates of the numbers of Catholics who come home associated with specific “Catholics Come Home” campaigns. However, these fall short of something scientific and reliable as the comparison is almost always made between a diocese’s Mass attendance rate during these campaigns in Lent or Advent (where Mass attendance is always higher) to regular diocesan October headcounts (where Mass attendance is lower). This is an “apples and oranges” comparison and I would imagine that all dioceses have higher Mass attendance numbers during Lent and Advent than in October—with or without such campaigns. It is also the case that the estimates in this post pre-date any campaign by the Catholics Come Home group. These are very well-done ads I am just not aware of any scientific measurement of their effectiveness or lack thereof (although I do know of one forthcoming study that will assess the long-term effects). There are also some aspects of the fact claims made by this organization that I do not believe to be measurable (e.g., “souls returned to Church”). At the same time, regardless of any effect(s), these are great videos with really good messages. Above photo courtesy of The Intrepid Traveler at Flickr Creative Commons. Residents of the Republic of Ireland filled out census forms today. Unlike in the U.S., there is a religion question on Ireland's census. The data collected will be an important barometer of sorts for Catholicism in Europe. Ireland is among Europe's most Catholic nations in affiliation and frequency of Mass attendance. This year, a group called Atheists Ireland has actively campaigned for residents to be "Honest to Godless." This group doubts previous census estimates of the Catholic population: "We believe the true figure for Roman Catholics is much lower. … We believe that this inaccuracy happens because many people tick their childhood religion out of habit, or tick a religion that they don’t really practice, or let somebody else fill in the answer for them. But you won’t write in your childhood home address unless you still live there. So don’t write in your childhood religion unless you still really practice it." Ireland has undergone enormous change in the last decade. It's economy boomed as the Celtic Tiger and drew in immigrants from elsewhere in Europe. Then it went bust with a housing slump and recession and many immigrants left. Irish Catholics learned the details of physical and sexual abuse of children committed by clergy and men and women religious in the Ryan and Murphy reports and many read the pastoral letter of Pope Benedict XVI that followed apologizing for the abuse. Ireland, like most other areas in Europe, has also been affected by a generalized and generational decline in religious practice and formal religious affiliation. 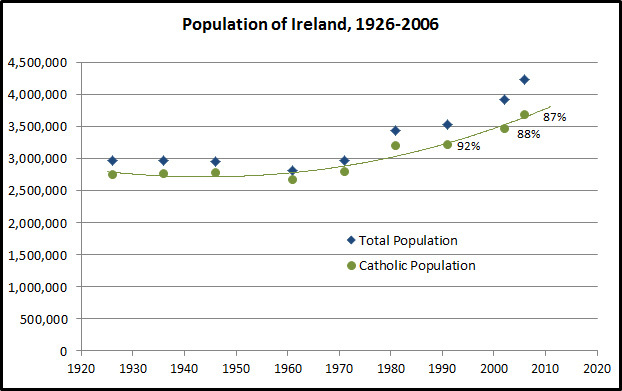 Yet in the last census, in 2006, there were more Catholics in the Republic of Ireland than had ever been counted in any previous census of this territory dating back to 1881. Just under 3.7 million identified themselves as being Catholic in 2006 representing 87% of the country's population and an increase of 6.7% from the previous census in 2002. Although growing, Catholicism has lost a bit of its overall affiliation percentage. Some of this has occurred through immigration. In Ireland this has resulted in some new population that is not Catholic. Although significant numbers of immigrants are also from Catholic areas of Eastern Europe (e.g., Poland, Lithuania). Some of the drop is also clearly related to changes in the Catholic retention rate. Some evidence of the changes occurring can be seen in population numbers within specific birth cohorts over time. For example, among young adults in 2006 (those born from 1972 to 1986), there are losses of Catholic affiliation. Catholics between the ages of 15 and 19 in 1991 numbered 312,899, As of the 2006 census, this group (then 30 to 34) numbered only 289,676 for a loss of more than 23,000 (-7.4 percent change). At the same time, numbers of older Catholics, those born from 1952 to 1971 have experienced growth. 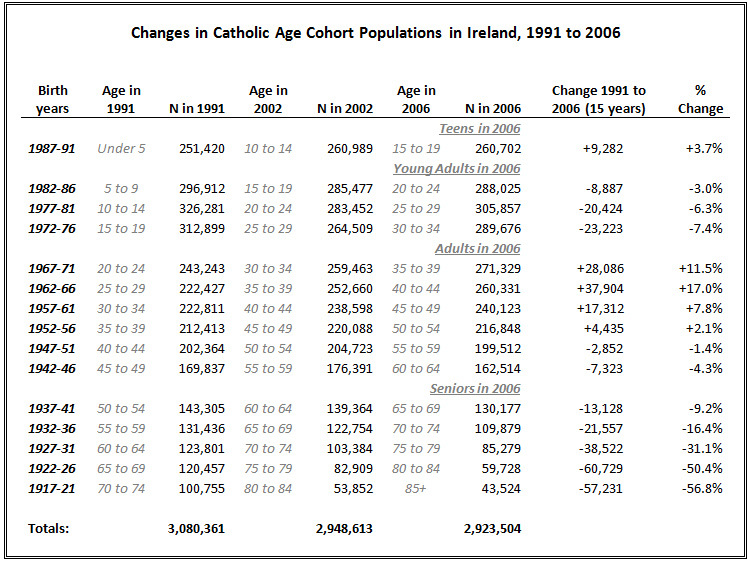 Among these adults in Ireland (ages 35 to 54 in 2006) there was a population gain of +87,737 between 1991 and 2006. Some of these gains may be related to adult conversion and certainly a lot of it may be related to immigration. However, some of it is also likely related to life-cycle changes. Some Catholics "come home" in their thirties after leaving the faith they were raised in during their teens and twenties (i.e., before the 1991 census). Among Catholics born before 1952 the losses in the table above are mostly related to mortality. Once the 2011 census data are out it will be interesting to see what happened to the 1972 to 1986 birth cohort. Will losses have been stemmed as Catholics come back? There actually is some evidence of this already occurring when comparing the numbers in 2002 to 2006 (yet this is not a perfect match for birth years). Dire predictions have been in the news for Ireland. Last month a paper presented by three physicists predicted religion would soon become "extinct" in Ireland and elsewhere in Europe using census data. I would comment further on this paper if I thought it had any merit (you did not misread that last sentence it said "physicists" ... I promise never to address the unified field theory or the existence of the Higgs-Boson particle on this blog). The paper had all the qualities religion reporters love but I don't think many sociologists of religion take it seriously. Its a good example of research that forgets the numbers being studied are human beings, not particles. History has many predictions of the demise of religion. This paper just represents the latest. Census 2010 has released the national data on race and ethnicity that will be used for the U.S. House of Representatives redistricting process. One of the results from these data that has drawn the most interest is the growth and distribution of the Hispanic/Latino(a) population, which now represent 16% of the U.S. population (up from 12.5% in 2000). The Census Bureau blog notes that "More than half of the growth in the total population of the United States between 2000 and 2010 was due to the increase in the Hispanic population." As noted in a previous post, 63% of Hispanics self-identified their religion as Catholic in the United States in 2010. Thus, growth in these numbers often represents growth in membership for the Catholic Church. CARA takes the Census numbers and analyzes these within diocesan boundaries. 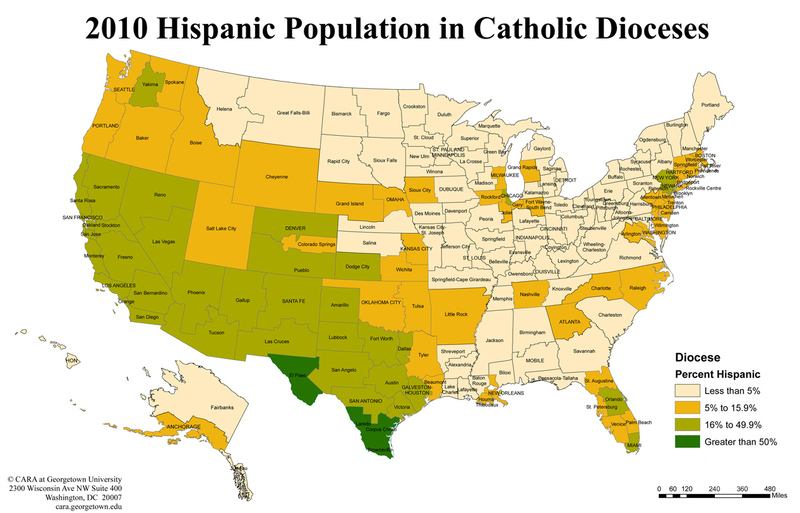 The map below, created by CARA Senior Research Associate Mary Gautier, shows the distribution of the Hispanic/Latino(a) population by diocese (click here or the map to enlarge). It is important to note that these data make no distinction regarding religion (this is not a Census question). In green dioceses 16% or more of the population identifies their ethnicity as Hispanic or Latino(a). The dark green represents areas where this is a majority.